Senator (and VP hopeful?) Francis Escudero appeared in the newspaper back pages last week. No, the story did not revolve around him and Heart; it was about sports. Surprising. We know Sen. Pia Cayetano to be a triathlete, but Chiz? Well, when the elections are just eight months away, politicians will do all they can for self-promotion. But Chiz made sense. He spoke about Brazil next year, lamenting how our 100-million-strong sports-loving nation has never won an Olympic gold medal. Worse, we might only have a handlful who’ll qualify for the Aug. 5 to 21, 2016 Olympics. “So far, we only have one athlete qualified to play in Rio de Janeiro in 2016,” said Escudero, citing the trackster Eric Cray. Since we competed in our first Games in 1924 in Paris, we’ve won a total of nine Olympic medals (seven bronze and the two silver medals in boxing by Anthony Villanueva in 1964 and Onyok Velasco in 1992). Will we ever win gold? There is one athlete that I wrote about who “may have” delivered for us that elusive gold medal. I’m referring to the swimming sensation in America who could have represented the Philippines. His name is Maxime Rooney and, just last month, he broke a junior world record in the 200-meter freestyle. 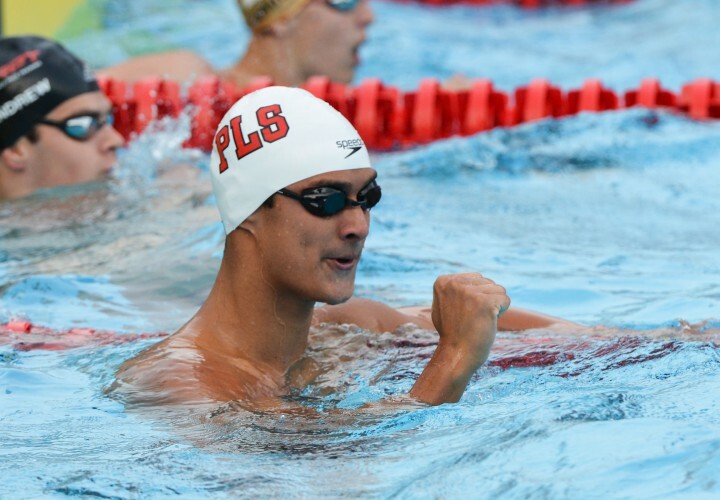 His time of 1:47.10 last Aug. 7 is not only the fastest ever swum by a below-18-year-old but, had that time been recorded by Maxime in the SEA Games last June, he would have won gold and snapped the fastest ever SEAG time. Maxime is only 17. I met his father Kennan the other week. After watching his son compete (and win two gold medals and a silver) during the 5th FINA World Junior Championships in Singapore, Kennan flew to Cebu to visit his relatives for a few days. Kennan Rooney is a Radaza. He looks like one. Spending an hour with him and his first cousin (Lapu-Lapu City Councilor) Harry Don Radaza at Kennan’s mom’s (Amy Radaza Jessup’s) 18th floor condo unit at the Movenpick Hotel was memorable. It’s not often that you’re seated beside the dad of a future Olympian. Maxime’s story began at the age of three when the family moved to a new home in California that had a small swimming pool. Maxime dipped in the water. No, it wasn’t formal and he wasn’t swimming laps. He simply loved the water. This was his first taste of being surrounded by this clear fluid that covers 71 percent of our planet’s surface. When Maxime turned six, that’s when he started to join swim meets. Towering tall for his age, he quickly swam like a fish and won by several lengths over his stunned classmates. Coaches took notice. This kid is special, they thought. Since then, Maxime hasn’t stopped and has clocked thousands of hours by his lone self, covering his eyes with Speedo goggles, knifing the water with his fingertips, breathing out and exhaling underwater. Today, Maxime’s training schedule is not for you and me. He arises before 4 a.m. and swims from 4:30 to 6 from Mondays to Fridays. Then he goes to school. After, he’s back at the rectangular-shaped pit, strengthening his muscles in the pool from 3:45 to 6:30 p.m.
And you’d think, given his all-swimming schedule, that Maxime would do badly in school? This kid is Superman in trunks and in school uniform. He has a 4.3 grade point average. The word is “sayang.” Lost opportunity. Three years ago, Kennan approached the Phil. swimming association, headed by Mark Joseph, and informed them that Maxime wanted to compete under the Phil. flag. Kennan exhausted all means for Maxime to represent us. He’d send Mark Joseph an email but would get a reply weeks or months after. In the end, Mark Joseph rendered this conclusion: Maxime was ineligible.